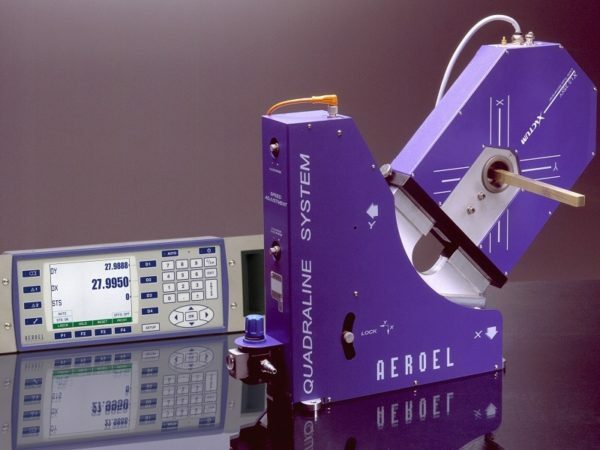 The Quadraline.XY is a laser system designed for control of dimensions of products with rectangular cross-section, such as ribbon cable, surgical tapes, plastic or metal section. Automatic regulation of the process is possible, with two independent channels. 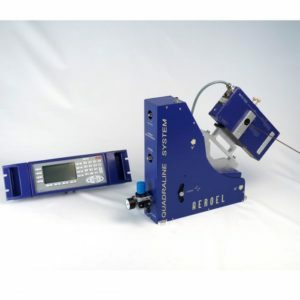 Scantron has worked with Aeroel systems for many years and has complete trust in the laser micrometer manufacturer’s expertise in the field of diameter measurement. If you’d like to find out more about the Quadraline.XY laser system for products with square or rectangular cross-sections, or to learn about other AEROEL solutions from Scantron, get in touch. 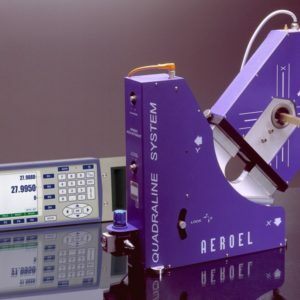 The Quadraline system is based on a dual-axis laser gauge installed on-line, which measures the external dimensions of the product along 2 directions at 90°. In such a way it is possible to measure both the height and the width, provided that the measuring directions are aligned along the axes of the rectangular cross section of the product. In addition, to avoid the small and random twisting of the product around its axis which may affect the gauging accuracy, special filtering software saves and processes only the minimum values of the readings for each axis; these are exactly the true dimensions being gauged. Should it be impossible to keep the product alignment, it is possible to mount the gauge on a special oscillating fixture (±5° max.) to guarantee that the two minimum values corresponding to the section dimension are always detected, whatever the orientation of the product section. 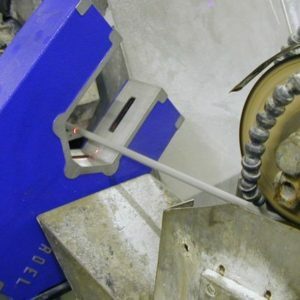 The fixture is powered by standard compressed air and the cycle time and the span angle can be easily adjusted by the operator. 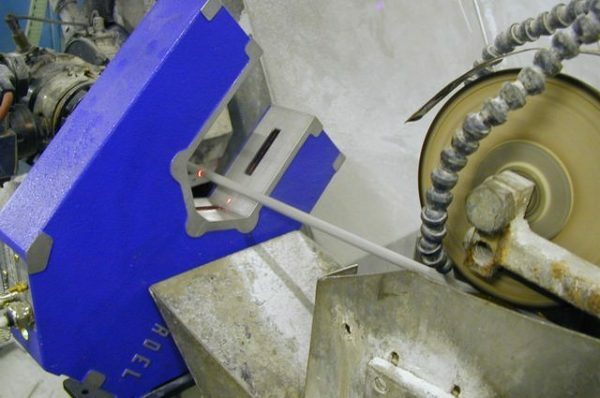 A limit switch provides the synchronisation between the measuring period and the oscillation cycle. The signals from the laser gauge are processed by the software which constantly compares the measured values with the nominal set-points entered by the operator. 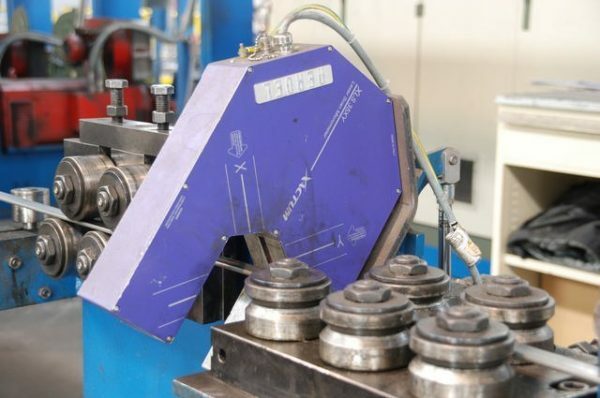 If the actual dimensions of the product tend to go outside the pre-set limits, the software automatically corrects the machine, to keep the product in tolerance. When working on rolling machines, 2 independent feedback loops are available to adjust the distance between the roll pairs that drive H and W dimensions. 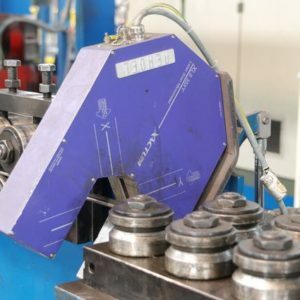 The results of measurement during manufacturing can be stored in memory and processed to produce the fully-detailed statistical reports required for quality certification. The Quadraline system uses dual-axis Xactum Laser Gauges.